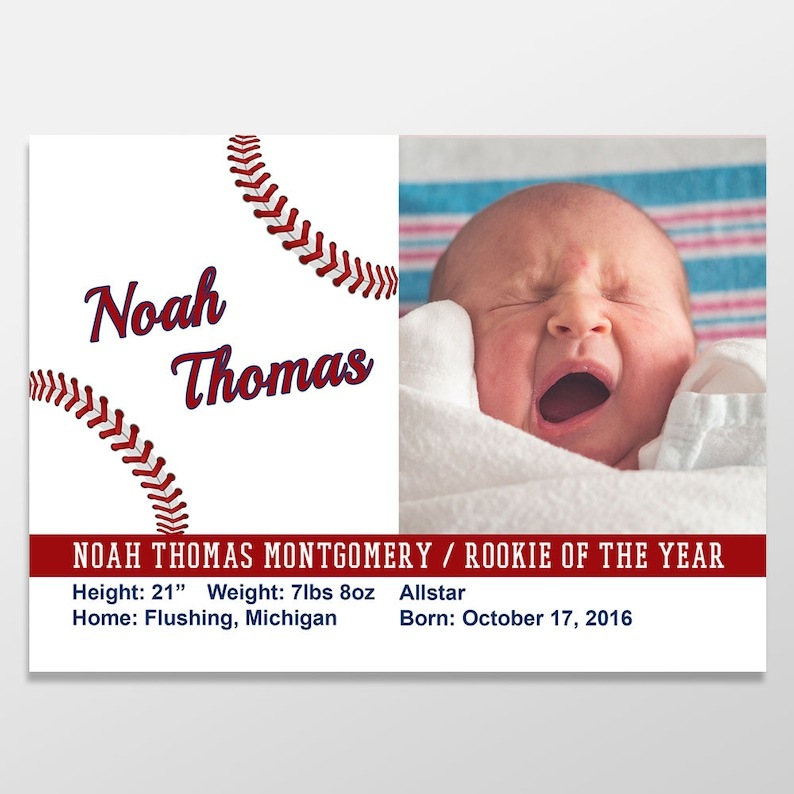 Announce the birth of your baby boy with this cute and fun baseball birth announcement featuring a photo of your new baby boy. 1. Purchase this (or another) design. 2. Convo me or Email me your information and high resolution photo (minimum 300ppi) to eoblanchard [at] gmail.com. 3. You will receive a proof via Etsy in 1-3 business days. If you would like an different quantity, please convo me, prior to purchasing. You will receive professionally press printed cards with complimentary white envelopes. Your order will be carefully packaged so your cards will arrive in perfect condition! All orders will be shipped within 72 hours, after proof approval, please convo me if you need it sooner. Shipping cost included for addresses in the continental United States ONLY. If you need items to be shipped outside the continental United States, please contact me prior to purchasing. Actual print colors may differ slightly from colors on your screen due to different screen resolutions and color depths. Due to the digital nature of this product, all sales are final. If you have an issue; however, please contact me, I would be happy to resolve any issues that may arise. Is there something you want, but don’t see? I am happy to create something just for you. Simply send me a message to get started. Exactly as pictured! It's perfect to remember a favorite beach! I could not be happier with my stamp and my interactions with the shop owner. Terrific! PayPal, credit card (via PayPal), or money order. No custom orders will be started until full payment is received. Please include your customization requests in the Notes to Seller at checkout, if requested. After I receive your order, I will send you a proof through Etsy Conversations within 3 business days. For printed items: Once you approve the proof, I will print and ship your item within 7 business days. For digital items: Once you approve the proof, I will send your file electronically within 1 business day. Once I've sent your electronic proof, you may not cancel your order. If I don't hear back from you about the proof within seven days, the item will be shipped as is. If you need more time, please convo me and let me know. My priority is that you are completely satisfied with your purchase. I will not print or send the digital file until you have given your final approval. Due to the nature of these products, I cannot except returns/exchanges of personalized items after shipment. If however, you are unhappy with your purchase for any reason, please notify me and I will do my best to rectify the situation. Also, if your item is damaged due to shipping or I have made a mistake, please let me know and I will replace it immediately. All orders will be shipped to the (physical or email) address listed on Etsy. Most items will be processed (you will receive your proof) within 1-3 business days. Need it sooner? Convo me and I will work with you to get you your item as quickly as possible. There is no shipping! I will email your high resolution digital files. You will receive a PDF or JPEG file (your choice) at the email that you have provided. All items will be shipped via, USPS First Class or Priority Mail or via UPS Ground. Please note that USPS does not guarantee delivery times, therefore neither can I. Expedited shipping is available for an additional fee (please contact me prior to checking out if expedited shipping is required). All printed items are securely packaged inside a cellophane (or paper) sleeve and rigid mailer to ensure safe arrival. International customers are responsible for any and all fees and tariffs associated with customs. These fees and tariffs are not included in either the purchase and/or shipping costs. By emailing me your photo/photos, you are stating that you have the legal rights to reproduce that image. Also, please try to submit photos that are 300ppi at the size you need it printed. Professional photos work best! When ordering please provide all custom information (wording, colors, sizing, etc) in the "message to seller" area. Please proofread your design carefully before you print or approve it. A reasonable amount of changes are included in your order (color, fonts, general layout, etc.). However, excessive or time-consuming changes may result in additional fees (based upon my discretion). Once the design has been approved and the final high resolution files have been emailed, any changes will be subject to an additional fee. If at any time you have any questions or you would like a custom order please feel free to convo me. Q: Can my item be a different size, rather than what is listed? A: Yes, just let me know what size you would like it to be (i.e. 4x6 rather than the listed 5x7, etc.). In most cases I will accommodate for free (i.e. requesting a smaller size). If there is an additional charge, I will provide pricing and create a listing for that size, if one does not already exist. Q: What fonts and colors are available? Q: If I print them, where should I print them? A: You can take them to your favorite photo lab or upload them to Snapfish, Walmart, CVS, Walgreens, etc. Many can have them ready for you in an hour! Q: How many changes can I make once I see the proof? A: As many as it takes! We will work together to make sure you are completely satisfied! If you have any additional questions, please don't hesitate to contact me. Thanks for stopping by my shop!